2015 was a year of landmark events for Eric Clapton. He turned 70 in March and then in May he performed his 200th concert at London's famous Royal Albert Hall fifty years after his first performance there with The Yardbirds. Back in May 2005, Cream came back together to play their first full shows together since 1968. Jack Bruce’s death renders another Cream reunion, but guitarist Eric Clapton returned to the Royal Albert Hall in May 2015 for seven concerts to commemorate a milestone: Clapton’s 70th birthday. In 2005, Cream played Madison Square Garden as their only shows outside of the UK, and Clapton repeated that pattern with his 2015 concerts; he performed at MSG right before he went to London. 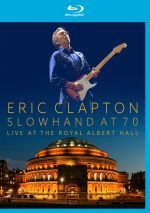 The Cream reunion came to home video via a DVD from the Royal Albert Hall shows, and the 2015 London shows also become the basis for Slowhand at 70. As expected, the 17-song setlist comes from various periods of Clapton’s long, storied career. As far as I can tell, Slowhand brings in songs from at least two separate shows. I checked out setlists and could not find one night in which Clapton played all 17 songs found on the Blu-ray. With Cream, Clapton covered Robert Johnson’s “Crossroads” on 1968’s Wheels of Fire. “Can’t Find My Way Home” stems from the short-lived super-group Blind Faith’s self-titled 1969 album. Another one-off band, Derek and the Dominos’ 1970 Layla and Other Assorted Love Songs produces “Layla”, “Tell the Truth”, “Key to the Highway” and “Nobody Knows You When You’re Down and Out”. Also from 1970’s, Clapton’s self-titled debut solo album provides “Let It Rain”. 1974’s 461 Ocean Avenue offers Clapton’s hit cover of Bob Marley’s “I Shot the Sheriff”, while 1977’s Slowhand brings us both “Wonderful Tonight” and another popular cover, JJ Cale’s “Cocaine”. With that we leap to 1989’s Journeyman for “Pretending”, while 1992’s Unplugged provides the hit “Tears in Heaven”. (Note that the version of “Layla” reproduces Unplugged’s subdued version, not the rocking Derek rendition.) “Driftin’ Blues” and “Hoochie Coochie Man” are covers off of 1994’s From the Cradle. A few more covers fill out the set, including two popularized by Joe Cocker: “You Are So Beautiful” and “High Time We Went”. A rendition of JJ Cale’s “Somebody’s Knockin’ On My Door” wraps up the tracklist. Note that Clapton defers to other musicians for the vocals on two songs. Keyboardist Paul Carrack croons “You Are So Beautiful” and “High Time We Went” while bassist Nathan East sings “Can’t Find My Way Home” with partial backup from Carrack. My first experience with Clapton live came back in 1985. I wasn’t a big fan but I loved British rock of the 1960s and respected Clapton enough to give him a look in concert. I remember little about the show. During my second year of college, a roommate wanted to see Clapton, so in the spring of 1987, I went to another concert. I remember little about the show. I saw Clapton again in the fall of 1988, as a friend was a guitarist and wanted to see the legend in person. I remember little about the show. Over the 27 years since then, I don’t think I’ve attended another Clapton solo show. I did attend the final Cream show at Madison Square Garden in 2005, and when Clapton toured with his old Blind Faith bandmate Steve Winwood in 2009, I went to one of those concerts. I’ve not passed on solo Clapton for 27 years because I disliked those 1980s shows – they were perfectly fine, I guess. But the fact I can’t remember much about them tells me that I didn’t get a lot out of them, and occasional examinations of Clapton home video products haven’t made me think I’ve missed out on awesome concerts. Actually, Clapton’s shows are probably better suited for viewing at home. Musically, Clapton always puts on a perfectly solid show. Does he do anything inspiring? Not often, but he plays the songs well and gives us enjoyable, professional renditions of the tracks. That continues to be the case with Slowhand. Clapton still sings well and his guitar playing remains impeccable. Some of his peers may have faded over the years, but Clapton continues to show mastery of his instrument. He also boasts a crack band who perform in a more than satisfying manner. Unfortunately, Clapton never developed the personality one expects from a front man. No, I don’t expect him to be Mick Jagger or Bono, but some signs of life would be nice. Clapton rarely speaks on stage. Outside of the occasional barked “thank you”, he lets his guitar talk for him – and to a degree, that’s fine. However, this leaves us with a show that lacks charisma. Concert tickets aren’t cheap, so the paying customer needs a compelling reason to shell out the $100-plus someone like Clapton would charge, and “played a professional show” doesn’t work – at least not for me. So that’s where home video comes in. A filmed performance such as Slowhand doesn’t remove all my concerns; Clapton’s lack of charisma still makes this a sluggish viewing experience. The lack of acknowledgement of the occasion perplexes me as well. I’ve attended two “milestone birthday concerts” in my life: David Bowie’s 50th at MSG in 1997 and Elton John’s 60th at MSG in 2007. Bowie offered a bunch of big guest stars, while Elton played a rarity-packed show that became his longest concert ever, so both turned into events that stood out from the norm. That doesn’t happen with Slowhand. It offers no acknowledgement of its apparent reason to exist – Clapton’s 70th birthday – and feels just like any “standard” Clapton concert. Does he play longer than usual? Nope. Does he bring out special guests? Nope. Does he throw in some rare fan favorites? Also nope. So what’s the point of an “event concert” if the artist treats it just like any other night on the road? Maybe if Clapton had broken his typical on-stage silence and offered some reflections, that would’ve added a sense of occasion, but he doesn’t do that. As I mentioned, he says almost nothing beyond “thank you”, though he does go wild and tell us he had a good time at the end – someone shut that man up! I also think it’s really odd that Paul Carrack sings the final song of the evening. Perhaps Clapton intends this as a statement that he sees himself as guitarist first and singer second, but it seems bizarre to conclude the concert without Clapton at the microphone. Carrack is a talented singer – heck, he’s a much better vocalist than Clapton himself – but no one paid to see Carrack. Whatever disappointment may come with the concert’s lack of ambition, I think Slowhand represents the show pretty well. A glimpse at Amazon reveals complaints from buyers about the direction, as they think the editing is too rapid-fire. I’m guessing these people haven’t seen many concert DVDs or Blu-rays. I’ve encountered many with dizzying visuals that seem to consist of nothing more than swooping camera moves and shots the linger no longer than half a second. Rest assured that Slowhand doesn’t engage in those tricks. Actually, it seems downright conservative and staid compared to the average concert video. Occasional “gimmicky” moments occur, but they’re rare, and the only real quick-cutting I noticed came during “Crossroads”; otherwise, the editing seems appropriate. The Blu-ray offers a good representation of the concert and lets us enjoy a feel for what it would’ve been like to attend. I just wish I thought the show itself seemed more inspiring. Slowhand at 70 presents a thoroughly professional concert but not one that stands out as especially memorable. It’s average Clapton. Eric Clapton: Slowhand at 70 appears in an aspect ratio of approximately 1.78:1 on this Blu-ray Disc. Overall, this was a quality presentation. For the most part, sharpness satisfied. Occasional wider shots looked a smidgen soft, but those remained the exception, as the majority of the show appeared well-defined. I noticed no problems with shimmering or jaggies, and edge haloes failed to materialize. No source flaws appeared either. In terms of palette, Slowhand went with subdued tones. Clapton and his band wore dark clothes that lacked visual pep, and lighting followed suit; the light added some variety but remained low-key. The Blu-ray reproduced the colors in a concise manner. Blacks seemed dark and deep, while low-light shots offered good clarity. The disc reproduced the concert well. As for the show’s DTS-HD MA 5.1 soundtrack, it also suited the material. As expected, the mix emphasized the forward spectrum, where we found strong stereo separation and spread. Elements remained placed where they needed to be and blended together smoothly. Surround usage seemed modest. As usual for a concert presentation, the back speakers favored crowd noise, with a dollop of musical reinforcement added for good measure. This made sense and the rear channels contributed just enough to the mix to make themselves worthwhile. Audio quality pleased. Vocals appeared warm and natural, while the instruments showed good reproduction. Bass response seemed positive, and highs came across with nice clarity and bite. This ended up as a satisfactory mix. Only one disc-based extra appears: a bonus song. We find a cover of Robert Johnson’s “Little Queen of Spades”. I’m not sure why this didn’t appear in the main program – perhaps because it’s more than 16 minutes long - but it’s good to find. We also get a booklet. It offers an essay from Paul Sexton as well as photos and credits. It acts as a nice complement to the set. To commemorate a milestone, Eric Clapton performed a series of concerts and Slowhand at 70 results. The music here sounds good but the show suffers from a certain lack of “specialness” that might befit the occasion. The Blu-ray offers very good picture and audio along with a few supplements. I think Slowhand gives us good but not great Clapton.